Need Unique Gift Ideas for Christmas? Well we have just added some really awesome Tabletop Water Fountains. Give the gift that keeps on giving year after year. These Tabletop Water Fountains are just what Santa ordered for the misses. 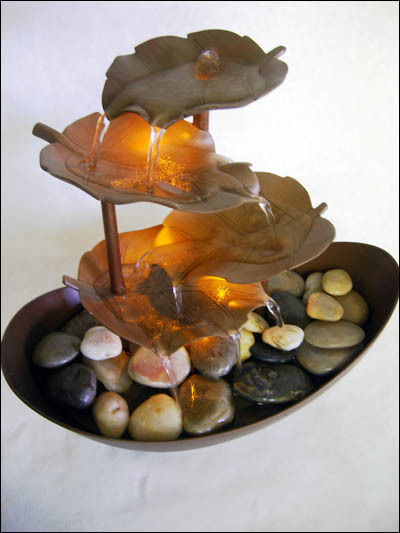 They can be placed in any area for your home creating a peaceful, tranquil, relaxing atmosphere with flowing waterfalls. Great for blocking out the background noises. We also offer outdoor water fountains and solar-powered fountains too! Talk about a great gift that keeps on giving. We have chosen the best of the best to show you here. If water is not your element, we do love fire pits to warm up the evenings festivities for men and dads, but be careful. Let’s take a look at some Tabletop Water Fountains and get some unique gift ideas. We can knock this, Christmas shopping fiasco, out with just a few clicks, Presto we’re done, how sweet is that? And we didn’t even break a sweat saving you time and money. So let’s get started! 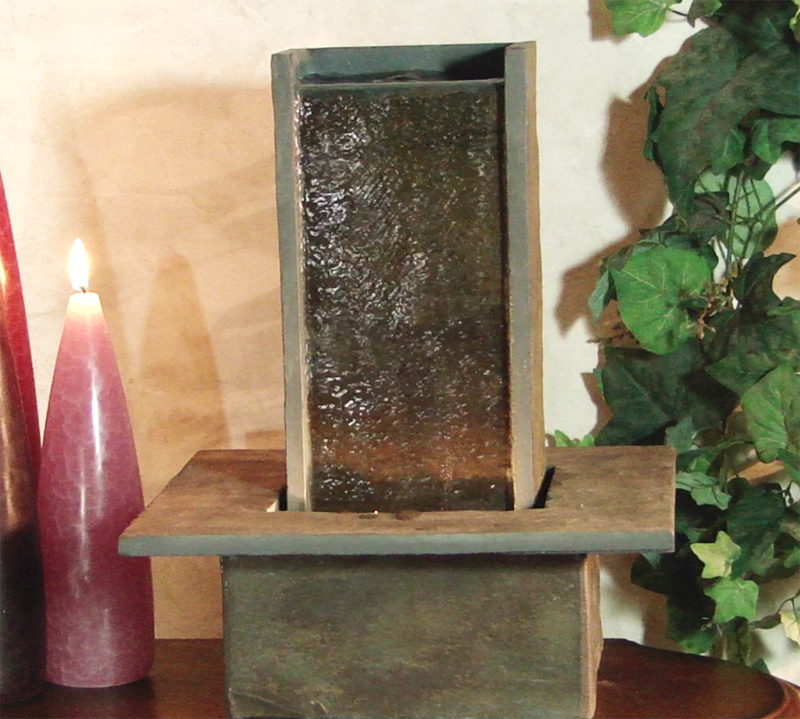 The large Moonshadow Tabletop Water Fountain is a very popular indoor water fountain. You’ll like the natural slate look and enjoy the pronounced waterfalls sound. The sound is just right, not too little or too much, it’s just right. At 15″ in diameter, this Moonshadow Tabletop Water Fountain is the perfect fit for an end table or a desktop. The river stones add to the nature look of this beautiful water fountain and are included. Makes a great night-light, that’s two, two, two gift’s in one. The Copper colored bowl comes in two shades light (seen here), and a dark copper color that adds a rich, elegant look to this Tabletop Water Fountain. Only $130.00 and ships to your door. See how easy that was! We have a smaller version, its kid brother so to speak. Let’s look at it. The Mini Moonshadow Tabletop Water Fountain is from the same family just a little smaller in size and price. 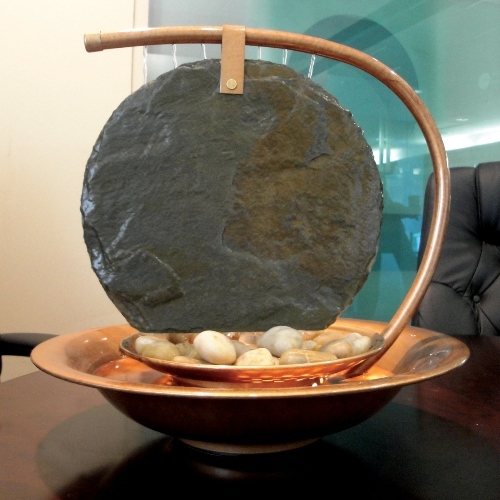 The Mini moon shaped slate face is covered with water as the water flows out of holes in the curved copper coated top. 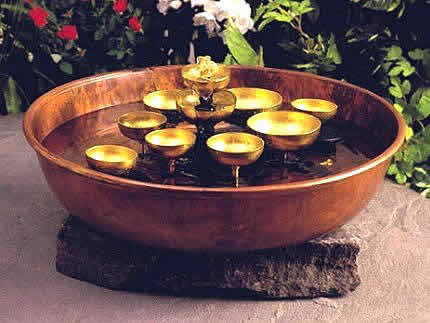 At 12″ in diameter, this tabletop fountain is the perfect fit for an end table or a desktop. Has wonderful waterfalls sound, yes, we’ll throw in the river rocks to save you time and money having to go a collect them yourself. Each slate rock is unique so no two water fountains are alike. Has LED Back lighting also. The Mini Moonshadow is only $99.00 and will ship right to you door just like its big brother. There are more pictures at our website if you would like to see more. Just use the handy-dandy links, they will take you right there no fuss no muss. Didn’t even break a sweat! We have others so let’s look. 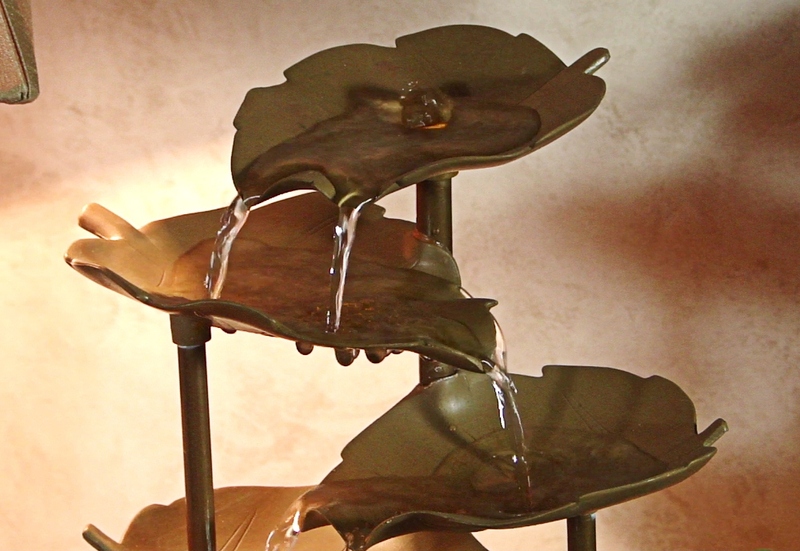 The Garden Leaf Tabletop Water Fountain creates soothing sounds of trickling water to relax your mind and body. Through integrated style and an ergonomic design, the Garden Leaves Water Fountain will create a serene and peaceful environment. 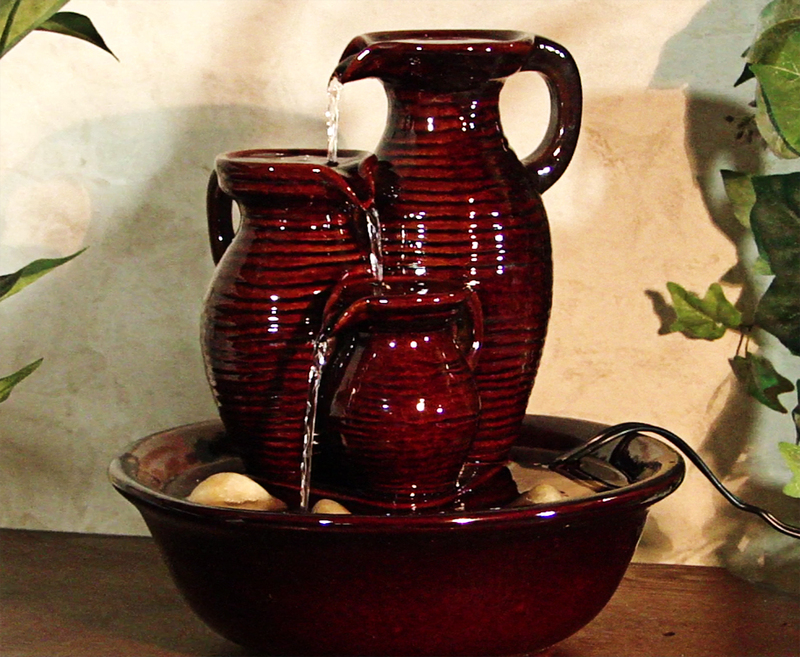 Easy to assemble, the motor is extremely quiet, you’ll love this soothing Water Fountain. It looks so nice at night too, about the glow you would get from a night-light so you can leave it on all the time. Includes faux copper leaves & bowl (made of high quality poly resin), real river stones, we just can’t get away from them, special effects lighting, and electric water pump are all included. Ships right to your door. Is only $55.00, it’s the gift that keeps on giving. Here’s a close up of the leaves. On to the next Unique gift Idea, because that’s why were here. Do you like big Slate Tabletop Water Fountains? The next one is all that and more. 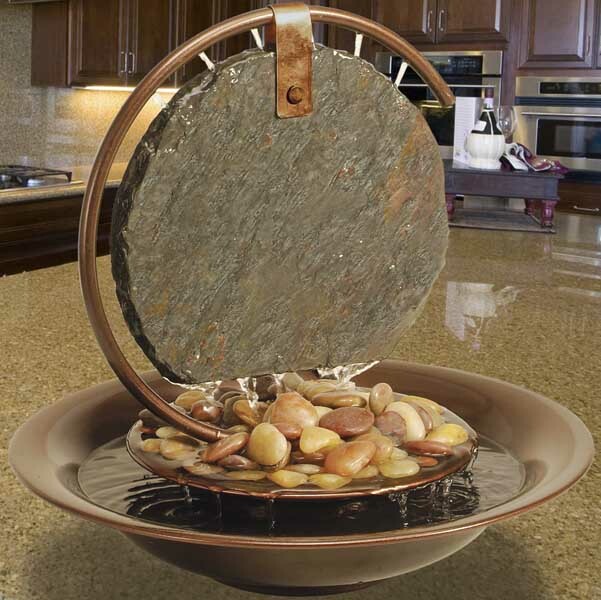 You’ll really like this Slate Indoor Tabletop Water Fountain as the slate is well cut and of high quality. The pump is very silent and effective. Water falls down the slate Stone Tabletop Water Fountain as the light illuminates the water from the bottom of the basin. You will love the natural colors of the slate. This Tabletop Water Fountain will fit well on any tabletop in your home or on your desk at work. Any place you wish to relax. Natural Slate Stone look and feel this Tabletop Water Fountains has a beautiful Waterfalls sound. This is a nice, sturdy and simple Designed Water Fountain. You’ll just love the way the water flows and it takes just a few minutes to set up. The picture on the website doesn’t do it justice. As the Water Fountain looks even more beautiful than it does here. It also has a LED Back light, sorry no river rocks are included, but you can always find them, Hint: Next to a river. All slate material weights about 25 lbs . We offer it at $135.00 yep, it comes right to your door, this Christmas shopping is kinda fun. 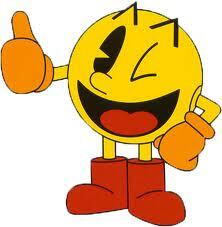 It’s so easy just to point and click we could do this all day and not even break a sweat. Want to see another one? This one has some Old World charm. In the 3 Jar Tiering Tabletop Water Fountain water pours from pitcher to pitcher, creating a soothing waterfalls sound. The electric pump continuously routes water through the Water Fountain creating a peaceful and relaxing atmosphere with Old World Style. 3 Jar Tiering Indoor Tabletop Water Fountain is constructed of a beautiful Ceramic material for years of enjoyment and your relaxing pleasure. 6″L x 6″W x 11″H and weighs only 4 lbs come with no hassle warranty on pump. Easy setup every things included. The right price at $95.00 and of course it comes to your door. Are we done Christmas Shopping yet? No, OK I will show you my favorite Tabletop Water Fountain, but then I have to go a chop some wood for the fire. So here’s my favorite. The Woodstock Water Bell Tabletop Water Fountain is really special because it combines a unique flowing babbling brook water sounds with the beautiful, deep mesmerizing tones of rings chimes and bells. The water bubbles up through the two center bells, spilling over into the pool of water in the beautiful copper basin. By slightly turning the top bell to the right or left, you can adjust the water flow and water sounds to match your mood. You can even adjust it so that the water spills over in such a way as to not move the bell chimes around. This changes the water flow (and water sounds), and it also eliminates the bell chime sounds if you are not in the mood. You’ll have several options with this Woodstock Tabletop Water Fountains flow, water sounds and bell chime sounds. Isn’t that cool? The sound of little bells and bubbling water. Talk about Christmas, you can hear Christmas bells all year-long or not! 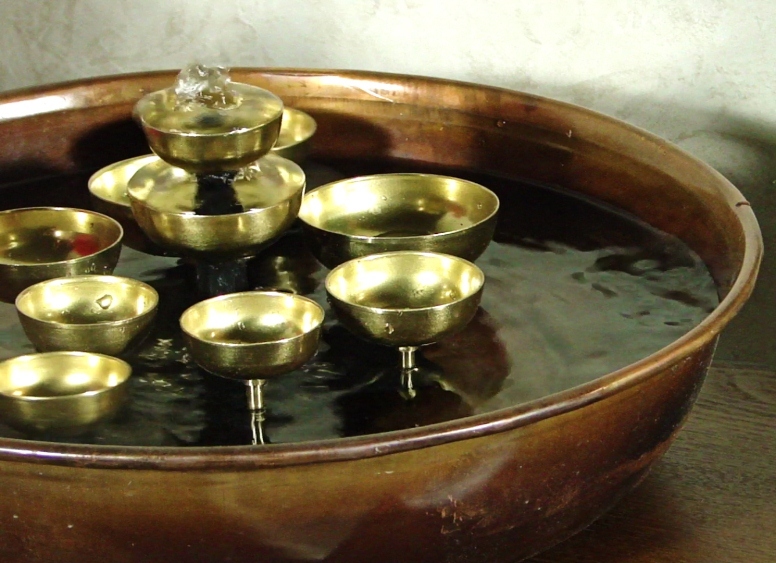 Within the basin, there are two floating brass chime bells that gently swirl around the other stationary brass chime bells, and when those two floating bells touch the others, they make deep soothing bell tones. Those tones, combined with the bubbling water sounds create the perfect relaxing environment. See. Discover the peace of mind you deserve in these Indoor Tabletop Water Fountains Features. Give the Unique Gift that keeps on giving. The serenity you’ll receive with these Tabletop Water Fountains will last a life time. Make your entryway a peaceful Waterfalls sanctuary for years to come. Happy Holidays from the Doowans! Presto, we’re done Christmas shopping! We have all kinds of Unique Gift Ideas for Christmas. Next What’s next Fluoride in our Drinking Water? I enjoy your site. Good content regarding this subject. Thanks a lot for posting about it.